Are secondary sanctions the key to a better U.S. North Korea policy? It will surprise no one to hear that the United States has few new or good ideas for managing North Korea. The Trump administration’s early enthusiasm for solving North Korea has waned into a familiar back and forth, as North Korea’s nuclear and ballistic missile capabilities continue to improve. Nevertheless, a new Center for a New American Security (CNAS) report tries to lay out an updated approach to sanctions against North Korea, based in large part on the success of sanctions against Iran. 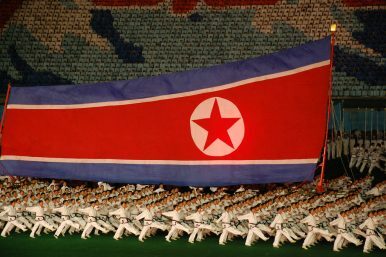 The authors suggest that the sanctions program against North Korea is not well understood; while the sanctions regime is heavy, it has evolved in complex ways over the past two decades. Indeed, there has probably been some confusion about the sources of North Korea’s sclerotic economy, which tend to lie with internal factors rather than a restrictive international sanctions regime. North Korea’s economy is displaying a mild level of growth, and (as the United States has discovered) it has a level of technical and engineering sophistication that enables serious work on nuclear and missile projects, with or without international assistance. North Korean trade is significant and growing, with China making up the overwhelming bulk (93 percent) of total exports and imports. International sanctions initially targeted North Korea’s nuclear and missile programs, hoping to forestall development (or substantially drive up the costs). Later sanctions shifted to economic targets, in the hopes of coercing the DPRK to change policy. Washington has sought to frame North Korea as an international problem that required an international solution, thus the focus on developing and enforcing a multilateral sanctions regime. Shifts in international society, including most notably the open hostility of Russia to virtually any U.S. diplomatic project, have effectively precluded further movement on this front. The authors of the report argue that the United States should push the multilateral, UN-focused sanctions effort to the background, and instead focus on efforts that Washington can carry out on its own. This includes, most notably, financial sanctions that could choke off the ability of North Korea to conduct basic trade and capital transactions. Aaron Arnold has discussed the promising role that banks could play in the process of targeting the financial resources of specific North Korean firms and individuals. They offer other suggestions for attacking North Korea’s trade lifeline, including targeting ports for additional monitoring, and making it more difficult to insure North Korean cargos. It is widely believed that an aggressive sanctions regime of this nature helped bring Iran to the negotiating table, thus making possible the deal that froze Tehran’s nuclear program. The United States has resisted such sanctions in the past, in part because of concern about the North Korean reaction. However, such sanctions would also impose costs on the DPRK’s trading partners, which happen to include important U.S. allies and economic partners. The most controversial aspects involve the use of secondary sanctions against Chinese firms doing business with the North Koreans. This would presumably deter Chinese firms (especially in the financial sector) from working with North Korea, at least at the margin. But it could also stir additional resentment against the United States in Beijing. Cognizant of the experience with Iran, the report is optimistic about the possibility of using sanctions to compel certain kinds of North Korean behavior. But would North Korea respond? The DPRK’s missile and nuclear programs are vastly more advanced than those of Iran, meaning that the core issues are largely strategic, rather than technical. As was discussed at the recent unveiling of the CNAS report, the effectiveness of a sanctions program in actually rolling back the North Korean program, rather than freezing it, is virtually nil. Consequently, the success of even a very aggressive sanctions regime will depend, to great extent, on how moderate U.S. expectations have become.